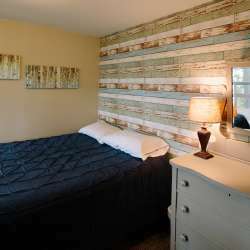 While Moonlight Bay Resort’s name may conjure up images of clear, moonlit nights with star-filled skies, it’s well known for its long, sunny days under clear, blue northern Michigan skies. Located on Spider Lake, an all sports lake located about 13 miles south of Traverse City, Moonlight Bay Resort offers all the amenities a family or group could want for a real, “Up North” getaway. As you’d expect, its long stretch of beach is a big draw, offering all sorts of recreational opportunities. Here, guests can swim in clear, cool waters (the inland lake warms much sooner than the big bay, offering an extended swimming season). The resort provides complimentary kayaks and rowboats and also rents pontoons and paddle boards. Kids will definitely love the water trampoline. For a real treat, take the wooden bridge to the resort’s small, private island and enjoy a beverage at the Tiki bar. 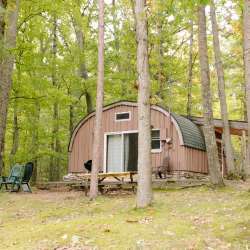 The resort’s nine wooded acres provide plenty of room and opportunity for off-water activities as well. Guests can enjoy traditional summer games like horseshoes and badminton. The resort also has trails that wind through the woods, which are perfect for a family hike or a peaceful stroll alone. 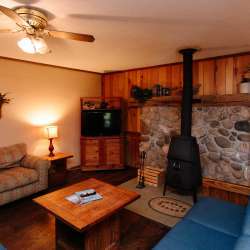 Opened in the 1940s, the resort has a traditional “Up North” feel about it…but with all the comfort and convenience that today’s guests desire. There are seven cottages, sleeping anywhere from four to nine people, depending on the particular unit. Each unit comes fully equipped with a gas stove, refrigerator, microwave, plus a plethora of pots, pans, and all the essential utensils. Select cottages have air conditioning and—new this year—some are now pet-friendly. Guests should note that the cottages don’t have TVs, but do have plenty of large windows for viewing the impressive nature shows that happen daily.